Behold a world starved of the graces won for human beings by the shedding of every single drop of the Most Precious Blood of the Divine Redeemer, Our Blessed Lord and Saviour Jesus Christ, on the wood of the Holy Cross, that flow into our hearts and souls through the loving hands of Our Lady, she who is the Mediatrix of All Graces. Behold a world of madness, a world shaped by the overthrow of the Social Reign of Christ the King by means of the Protestant Revolt. Behold a world that has plunged headlong into the abyss without realizing that this is so, a world where men and their nations have, casting aside the Social Reign of Christ the King as It must be exercised by His Catholic Church, placed themselves under the reign of the devil under the slogans of "liberty," "equality," "fraternity," "democracy," "human rights," "dignity" and a thousand other noxious phrases that have been given us by the lords of naturalism whose falsehoods have been spawned and propagated by Judeo-Masonry. Behold a world that is choking from a deprived of Sanctifying and Actual Graces as a result of the sacramentally barren liturgical rites of conciliarism. Clusters of young men hurled bricks and aimed fireworks at riot police officers before a backdrop of burning cars and buildings early Sunday in north London as a protest turned into an all-out riot. Demonstrators on Saturday evening marched to a police station in the Tottenham area of London to protest the death of Mark Duggan, a 29-year-old father of four who was killed Thursday in what The Guardian newspaper described as a “shootout” with officers from the Trident unit of the Metropolitan Police, which investigates gun crime. By 10:20 p.m. local time, the protest had turned violent. Two empty police cars were burned and officers were “subject to bottles and other missiles being thrown at them by the crowd,” according to a statement released by the police. By midnight, the crowd had grown to several hundred. 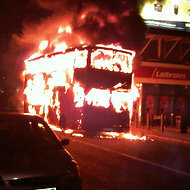 An entire double-decker bus burned, the black smoke joining the fumes from several burning shops. Riot and mounted police officers arrived at the scene. As of 2 a.m., groups of young men, ranging in age from 16 to 30, were still facing off with the police, who stood their ground behind plastic shields. Tottenham is an area of mostly poor minorities; a significant portion of the population is black. “How many black people have to die around here?” asked one of the youths, referring to Mr. Duggan. He gave his name as Pablo. “I hate the police,” he said. Every few minutes, as cars burned on Tottenham High Road, young men with hoods pulled over their heads and bandanas over their mouths launched fireworks at the officers, who advanced occasionally but did not charge. Others searched the glass-covered ground for projectiles to hurl. One group smashed the brick garden wall of a residence on Rawlinson Terrace and scooped up the bricks. As of 3:45 a.m. local time, there had been no official reports of injuries or arrests. On Twitter, startling pictures claiming to be from the scene popped up almost instantly, with some posters saying the destruction included a bus, a police station and another building. Twitpic A photo reported to be from the scene in Tottenham. Photos posted on the Web site Hashalbum.com/tottenham, described as being from the scene in Tottenham, depict a bus engulfed in flames and people in the smoke-choked streets. As bystanders watched from a distance, a group of young men smashed through the glass door of a William Hill betting shop and kicked in the door of at least one private home, while helicopters circled overhead. The smoke was so thick in places that visibility was down to 20 feet. A group of young men laden with looted groceries sprinted down a side street, screaming, “Let’s load up!” as more whipped past on bicycles and mopeds, back and forth into the fray. The young men seemed to be both jubilant and deadly serious; the street had an unsettling partylike atmosphere at times, punctuated by intense violence. Milwaukee and West Allis Police are investigating a string of mob-like behavior involving a very large and unruly crowd near the Wisconsin State Fair Crowds Thursday night. Several people were hurt and nearby cars and homes were damaged. State Fair officials say 24 people were arrested inside the fairgrounds Thursday night after fights broke out at the midway. At closing time, those fights made their way outside the park. State Fair Park CEO Rick Frenette says seven park police officers were injured, including two who were taken to the hospital. Frenette says there will be an increased police presence following disturbances at the fair and surrounding neighborhood. And, he says all those under 18 attending the fair will have to be accompanied by a parent or legal guardian after 5 p.m.
Milwaukee Police say just after 11 p.m. Thursday they responded to complaints of an unruly mob attacking cars, people and leaving damage in its path. Hundreds of young people left the fairgrounds and made their way down 84th Street and the surrounding neighborhoods, smashing car windows, throwing rocks and beating people who were leaving the fair. Several people were punched in the face. A child was pushed to the ground. One woman required stitches and another will need surgery for her injuries. Police are continuing to search for suspects involved in the incident. One witness says he saw a group of 20-30 young men attack someone walking by. "A group came through and the guy was kind of not really looking and was making his way through the crowd like anybody else would, and just wound up on his knees and they wound up punching him," says the witness. "I had one kid you know asking me to sit on my porch until it cleared up because he was afraid to walk by himself." Witnesses described the mobs as young African American teens. Friday, Milwaukee Aldermen Bob Donovan and Joe Dudzik released a bold statement about what they called a "deteriorating African American culture in our city." "Are large groups of Hispanics or Hmong going out in large mobs and viciously attacking whites? No. "There are repurcussions for single-parent homes where children aren't properly supervised, and where they aren't held responsible for their actions. "We believe change must come from within the African American community, where new seeds must be sown." Despite what happened Thursday night, there are hundreds of people entering the fair Friday morning. Unfortunately for the well-meaning and rather courageous aldermen, Bob Donovan and Joe Dudzik, there can be no change in any community absent the unconditional conversion of men to the true Faith, outside of which there is no salvation and without which there can be no true social order, thus permitting them to have access to the true Sacraments to reform their lives. There is no naturalistic solution. None. There is no way to get this savagery, this barbarism back into the toothpaste tube, so to speak. After all, how can we expect better when the minds of men and the laws and their mores have been corrupted and poisoned by the ever-mutating heresies and sacrileges and blasphemies of Protestantism? How can we expect better when a systematic warfare has been made upon the true Faith by the agents of Talmudic Judaism? How can we expect better when the conciliar revolutionaries themselves, having contented themselves that the Social Reign of Christ the King is but an anachronism of the past, have made their "reconciliation" with the false, naturalistic, anti-Incarnational, religiously-indifferentist and semi-Pelagian principles of Modernity? How can we expect better when God is blasphemed by alleged "Catholics" in "interreligious prayer" services and when the false "pope" praises the nonexistent ability of false religions to "contribute" to the building of a "better world"? How can we expect better in our own country, the United States of America, where over fifty-three million preborn babies have been killed by surgical means in the past forty-four years since various states began to "liberalize" existing statutes regulating abortion in the "hard" cases? How can we expect better when most married couples in the world, to say those who are sinning by means of natural vice, use contraceptives, most of which are abortifacients, that is, baby-killing potions? How can we expect better when rank perversity is promoted under cover of the civil law and abroad in popular culture, when immodesty and indecency and vulgarity are on full display in the stores where they shop and never far from the lips of ordinary citizens who work or ship in those stores? England is suffering quite precisely because of the aftermath in time of the overthrow of the Social Reign of Christ the King by the venal, corrupt Henry Tudor, Henry the Eighth, in 1534. a tyrant who presided over the killing of over 72,000 Catholics who remained faithful to the true Church despite all of the threats made against them (defection of family members, excessive taxation, loss of titles of nobility, expulsion from the convent and monastery lands, imprisonment, torture). The United States of America, having been founded in the wake of the English Protestant Revolt, is suffering because its false, naturalistic "founding principles" had to lead to social collapse as the men who propagated those principles believed that a "self-governing people" could regulate themselves and their society by their own lights or merely with the help of some generic "God." The men who had a founding hatred for Christ the King did not believe that it was necessary for men to have believe in, access to and cooperation with Sanctifying Grace in order to persevere in virtue over the course of the long term, and such a fictitious belief must lead to the degeneration of men and their nations over the course of the long term. The Catholic Church is, Pope Leo XIII reminded us, Christianity incarnate, giving us yet another rejoinder to the the Ratzinger-inspired "the Church of Christ subsists in the Catholic Church" lie that is found in Lumen Gentium, November 21, 1964. It alone had transformed pagan society from barbarism, which had indeed "disappeared in proportion as Christianity extended its sway." And paganism and barbarism and superstition have returned in proportion to the loss of the the influence of Catholicism in the world caused by the forces of Modernity in the world and the forces of the Modernism in the counterfeit church of conciliarism. But how would it fare with the poor in such a world? They are God's chosen portion upon the earth. He chose poverty himself, when he came to us. He has left the poor in his place, and they are never to fail from the earth, but to be his representatives there until the doom. But, if it were not for the Precious Blood, would any one love them? Would any one have a devotion to them, and dedicate his life to merciful ingenuities to alleviate their lot? If the stream of almsgiving is so insufficient now, what would it be then? There would be no softening of the heart by grace; there would be no admission of of the obligation to give away in alms a definite portion of our incomes; there would be no desire to expiate sin by munificence to the needy for the love of God. The gospel makes men's hearts large; and yet even under the gospel the fountain of almsgiving flows scantily and uncertainly. There would be no religious orders devoting themselves with skilful concentration to different acts of spiritual and corporal mercy. Vocation is a blossom to be found only in the gardens of the Precious Blood. But all this is only negative, only an absence of God. Matters would go much further in such a world as we are imagining. Father Faber prophesied the events of our own times. A Catholic tradition teaches us that the world will end when the last true priest has died, either from a natural death or after having been killed, thereby the depriving it of all the Actual Graces necessary to sustain it. Indeed, this is the point of the novel written in 1920 by Myles Connolly, Mister Blue. Although I am not an expert in "end times," concentrating on my knowledge that my own "end time" could be even before this article is posted (! ), we must be very close. We must be very close. We must pray more Rosaries each day. We must make more and more sacrifices each day. We must recognize that, unlike the lords of Modernity in the world and the lords of Modernism in the counterfeit church of conciliarism, there is nothing short of Catholicism that can save men and their nations. There is no such "shortcut" to be found in the various and interrelated naturalistic theories of Modernity and the heresies and errors of conciliarism, including that of "religious liberty" that will be a partial focus of the next article to appear on this site. We pray to Our Lady to remain firm in the Faith as we pray as many Rosaries each day, especially during this month of her Immaculate Heart, keeping in mind that one day there will be the Triumph of her Sorrowful and Immaculate Heart.